8K is right on track. That was the key conclusion of Michael Cioni, SVP Innovation at Panavision in a talk given at the QLED & Advanced Display Summit in Hollywood last week. He based this on an analysis of previous generations of technology from multiple disciplines. Not only is 8K right on track, its adoption is essentially inevitable and he is now starting to think about 16K and even 32K! Addressing the first bullet, he said that when someone instantly rejects something, what this really means is: I didn’t ask for it: I don’t understand it; I am uncomfortable with it. To address the other concerns he introduced the concept of ‘Moore cycles’, based on the rule developed by Gordon Moore that the density of transistors will double every two years. His Moore cycle is two years but applied to several types of technology. 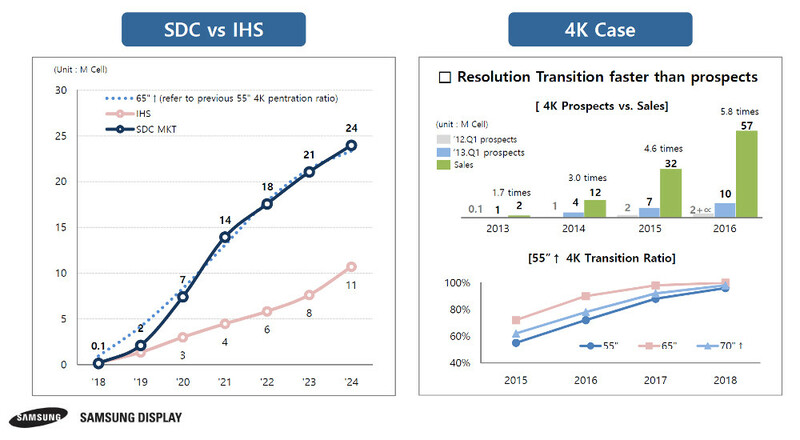 For example, in 2001, SD resolution was mainstream, but by 2009, 4K resolution was introduced in professional markets. This time frame corresponds to 8 years or 4 Moore cycles. SD resolution is about 0.3 megapixels, so doubling that four times leads to a resolution of 2.4 megapixels, which is very close to DCI-4K resolution of 2.2 megapixels. Continuing the concept for another 4 Moore cycles leads to the conclusion that displays with 38.4 megapixels should be introduced in 2015. In 2015, 8K faced a lot of issues, but Cioni helped put together initial solutions to these challenges, thus supporting his analysis. Three years later, consumer 8K TVs with 33.8 megapixels are available. 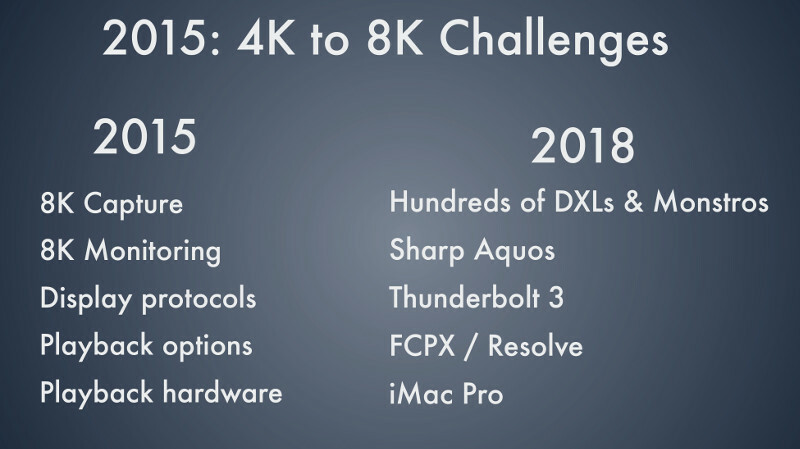 From this analysis, Cioni concluded that 8K resolution is not too high but just another step along the path toward ever increasing resolutions. To bust the myths that 8K downloads are too slow, Cioni looks at state of the art connectivity speeds in 2000 (Firewire 400 at 400 Mbps) and in 2016 (Thunderbolt 3 at 40 Gbps). Again, 8 Moore cycles suggests that we should be at 51 Gbps in 2016 vs. the 40 Mbps offered by Thunderbolt 3, so slightly behind the curve. To address the storage issue, he compared the transfer costs in 2000 and 2018 (9 Moore cycles), finding we are now ahead of the curve on this one ($18.40 GB/s in 2000 vs. $0.04 GB/s in 2018). For render times, Cioni said that rendering SD video in 2000 was essentially real time as you had to play the content to render it. In 2018, an SD transfer can be done 300 times faster, ahead of the 256x improvement predicted by the 9 Moore cycles covering this time span. What is particularly important about this analysis, says Cioni, is that all of these advances happened in different industries and technologies with a range of vested interests, yet they all moved along at roughly the same pace. All of the cutting edge 8K solutions of 2015 are now available as commercial solutions in 2018. All of this, he concludes, supports the inevitability of 8K. While 8K production is more expensive than 4K or 2K, on a relative basis, the cost is exactly the same as it was at the introductory stage of 2K and 4K. That’s a powerful conclusion and points to the need to educate the professional community on these aspects of 8K. 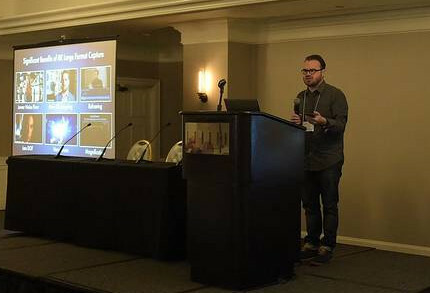 On the consumer side, a presentation from Display Supply Chain Consultants made the case that the huge investment in 10.5G class fabs will create a massive oversupply of 65” and 75” displays in the next few years. (8K is Closer than You Think) To help differentiate product, fabs will fill part of that pipeline with 8K displays. So despite the naysayers on 8K, technology evolution and display side push means 8K will come to market. The only question is: will it penetrate at the same rate as 4K? On this, Solat had a chart suggesting that current forecasts for 8K TV penetration are too low – just as they were in the early stages of 4K adoption. Seems like we won’t have long to find out who is right.